We woke this morning a little depressed after listening to last nights AFL game against Collingwood - after the first 10 minutes I think we both thought that was it for Geelong and turned the computer off at 3/4 time with disgust! In the morning we couldn't resist but listen to the news to see just how much Geelong lost by ... 41 points - Collingwood must have gone home in the 4th quarter!!! We sat there eating our brekky lamenting over the game - it was a sunny day but very cold - we woke with a frost on the tent and guessed it was below zero during the night and maybe only a few degrees whilst eating brekky. We started out cycling early and there was a fair bit of traffic with us and I thought that this must be a busy route the Thunderbolts way but they all turned off at Gilgai and went to Armidale! 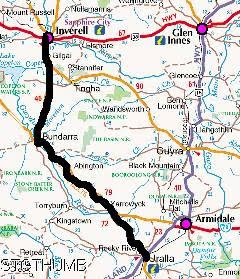 It is all climbing from Inverell to just after Gilgai and from here is is up and down to Bundarra. While cycling along going up hill I thought my toes would warm up but they were very cold indeed and my arms were very cold so at our first stop I made the decision to sacrafice my maroon socks and cut the toes and make them into arm warmers! Below are the results! It was so good riding along with them as the body and legs are warm but the arms get cold as by now the sun was always hiding behind the clouds so as dorky as they look they serve their purpose. We had a cuppa at around the 33km range which was at the top of the range before you have a nice 4km hill descent and then into Bundarra which is at 45km. Instead of unloading the chairs to have a cuppa Neil got Koutas blanket out for us to sit on and Kouta immediately thought it was for him to have a rest on! Not much at Bundarra which is at 660m above sea level but there was some nice old buildings and above is one of them. Bundarra does have a local caravan park which has toilets, showers and power - $10 for a van and $7 for a tent - so we will remember it for next time we pass through. 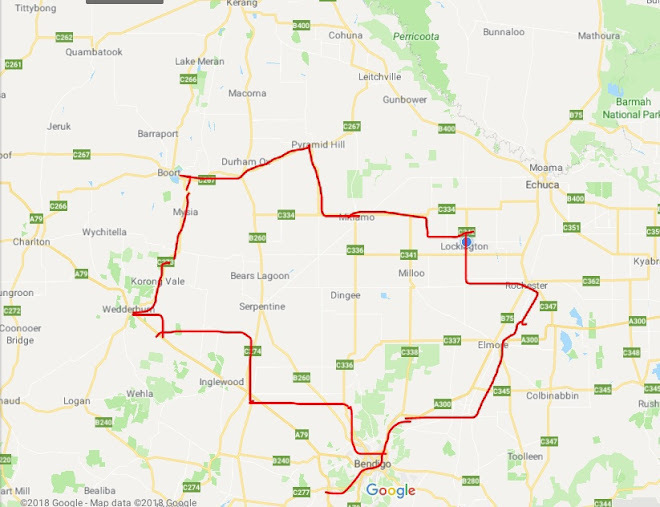 Originally we were going to stop at the rest area which is a few kilometers south of Bundarra but we decided that the main hill climbs will be around the last 20kms to Uralla so since Bundarra is about 74km from Uralla we decided to do another 30km and camp wild tonight. It was a good decision as you went down to the Gwydir River and then up a bit and the next 30km was relatively flat and easy going and the clouds even blew away with the tailwind we had so I was able to take my new arm warmers off! Beautiful country riding through here but one thing we noticed is that it is alot drier this side of the range (the one just before Bundarra) as it is quite rocky and the grass is long and brown. We found a spot around the 74km mark and that left about 45km for tomorrow which is hopefully enough time to get into Uralla before lunch and before the rain that is forecasted starts! ... he is quite camouflaged isn't he! and this was only a few meters from the tent. It has been a while since we bushed camped and it was a lovely spot. Around the tent and in the surrounding long grass you occassionally get these little white flowers which are quite pretty with their maroon centers. At least last night wasn't as cold as the night before and we reckon it was only around 5 degrees during the night and this morning it was very cloudy and grey but not damp and frosty. We packed up and left around 7.30am knowing this was going to be a hilly day. The above photo is just typical of the area this side of Bundarra but there is alot of cattle and sheep which look very warm to us - and one flock of sheep had yet to be shorn (spelling?) and we did think that maybe they could give us some wool for some socks - we both didn't have socks on our feet and the toes were absolutely frozen and they just wouldn't warm up - everything else got warmed up when climbing the hills but the toes wouldn't. So at the first break we got them out and again as dorky as we both looked they served their purpose - I did look a sight with socks and sandals and my socks come arm warmers on!!! Even Kouta wore his coat throughout the ride and in the photo below you can just see my feet with my socks and sandals. It was incredibly undulating all the way to Uralla and the down hill parts were a real killer as in the time to go down you cooled down very quickly only to begin again at the bottom. Generally the down hills were steep and the beginning of the uphill a little steep and then they tapered off for the majority of the hill so you certainly went through you gear changes! From Yarrowyck to Uralla it is still up and down but the majority of it is up with the final 5km into Uralla very undulating and steep at times. The legs felt okay riding the hills but I found the downhills a little difficult as my leg muscles would cool down too quickly and were very stiff when it came to the climb again and wouldn't loosen up until they warmed up again! As you can see from the photo above Uralla is quite high up - 1000m above sea level and this is not the highest we go - when we leave Uralla for Tamworth we climb up to 1100m I think! We got to Uralla around 11.40am which is good timing as the Supermarket was closing at 12.30 and a few drops of rain had started to fall. We picked up supplies and got to the campground frozen and set up the tent - we had a shower to warm up and are now currently in the tent with another heat warming device - Neil came up with the idea to put hot tap water in our large drink bottles and use them to warm up our feet - he got the idea from a book he was reading set in the 1800's where they warmed their feet on heated bricks - the closest we could come up with is heated bottles and I tell you our toes are warm! Tomorrow we will find an op shop to by some warm clothes as it is currently 13 degrees (todays high) and it is raining and I think the rain is here for a few days - it is not heavy rain just a light sprinkling. I went to the game with Brenton and Jesse(not happy boys). Pies just backed right off second half; I suppose having Luke Ball get injured, they didnt want anyone else hurt. It was electric at the game; I imagine the grand final will be a bit of a disappointment. Couldn't come close to the build up to that game. I am trying to get gf tickets; I can possibly get some for $1000 each or $1200 each(dont faint). So, no. I wont be going to the game. Not unless I can manage some through AFL leftovers. No chance of that!